We are with you all of the way, starting with the rubber mixing, rubber compounding and fiber loading in polymer based materials. Finite Fiber offers a variety of services that will speed and ease your move into the world of precision cut fiber-loading. We go far beyond just supplying the premium quality fibers. Finite Fiber will assist customers with everything from re-formulation (formulation services) of your compound - to - production process and/or procedure recommendations - to- complete turnkey project management services that puts our expertise to work for your professionals. With turnkey service, we perform every function necessary from start to finish. This service minimizes your time demands while keeping you in charge through frequent reporting on every stage of the development. These are the major areas reviewed to assure consistent effective and efficient implementation of fiber introduction. Generally speaking, short fibers do not easily disperse in rubber; however, this can successfully be accomplished by mixing with the other ingredients in an internal mixer or on a two roll mill. Dispersion of short fibers into rubber involves “wetting out” of the fibers with the rubber and can also involve the physical breaking up of the fiber bundle if the fiber has been cut from cord material that has multiple ends that have been twisted together. Such material may also contain surface chemicals that have been applied to enhance the adhesive qualities of the fiber such as RFL and isocyanate dips. Fibers from apparel sources often contain sizings and dyes. For short cut industrial fiber cords, mixing in an internal mixer would involve adding the fiber to rubber early in the mix cycle, wetting out of the fiber bundles with the rubber batch, breaking the fiber bundles apart, and dispersing the individual fibers into the rubber. Mixing contact time of the fiber with the rubber under shear of the mixer is what disperses the fiber. There are processing additives such as salts of fatty acids, fatty acids, waxes, resins, and oils that can aid in the dispersion of fibers in rubber. These are often added with the fiber early in the mixing cycle. 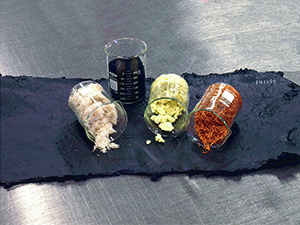 Rubber batches containing fibers will usually display higher viscosities particularly if the fiber loading is high (>10 phr). This can cause an increase in mixing temperature due to internal friction and in the worst case create scorch in the resultant rubber compound. In order to alleviate this tendency cooling water in the mixer (jacket and rotors) may be turned on, lower RPM mixing speed is often used, and the fill factor of the mixer may be reduced. The state of repair of the mixer may also be a factor as new or refurbished mixers will have “spec” mixing rotor clearances (rotor tip to jacket) and so higher shear rates, while older mixers can have lower shear rates due to wear of rotors and jackets. Experimentation in mixing techniques is encouraged as every mixer has its own unique characteristics. Mixing on a two roll mill is usually accomplished by banding the rubber on the mill and then adding the fiber in increments to the rubber. A word of caution: as fiber toughens rubber considerably (particularly at higher fiber loadings) cutting and turning such mill batches with a mill knife can become increasingly difficult; if this occurs the mill operator is encouraged to stop the mill while cutting the batch and restarting after the cut has been made. Two roll mills are often employed to prepare fiber “master batches” with fibers that are difficult to disperse. While two roll mill mixing is less efficient than mixing in an internal mixer due to lower shear rates which increases mixing time, the operator can visually observe the dispersion of the fiber into the rubber and will know when the batch is adequately mixed. Experimentation on adjusting the water flow through the mill rolls for cooling, using different milling techniques, and incremental nip adjustments will aid in optimizing mix procedures. 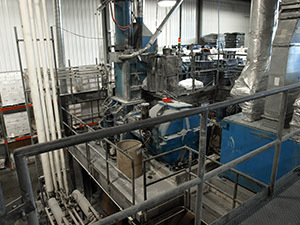 The addition of fiber to a rubber batch usually increases the internal filler surface area of the rubber batch which is more pronounced for shorter fibers and flocks. This increase in total filler surface area causes increased viscosity and internal heat generation during mixing. For higher fiber loadings a much drier batch results. To remedy this, a lower viscosity polymer, additional plasticizer, resins or processing aid materials can be used. Fibers have aspect ratios (length/diameter) and will tend to orient with the direction of flow like toothpicks in a stream of running water. Processing rubber batches containing fibers by milling or calendaring will orient the fibers in the flow or machine direction grain of the rubber. This fiber orientation is one of the major advantages of using fiber as reinforcement for rubber and plastics to achieve directional physical properties. Depending upon the characteristics of the fiber (aspect ratio, loading, degree of dispersion, etc.) certain physical properties such as elongation and modulus may be five times higher/lower in the grain direction than in the direction perpendicular to the grain. Such directional properties of fiber filled rubber are advantageous for use in power transmission, flat and conveyor belting. Fiber reinforced rubber extrudes better when fiber loading is low and the length of the fiber is very short. Higher fiber loadings and longer fibers will increase the internal surface area of the fillers in the rubber producing higher viscosity rubber. Higher viscosity rubber is more difficult to extrude. The fibers will orient to some degree with the flow through the extruder die. This orientation will not be optimal in thicker extrudates as the flow of the rubber is not unidirectional. The rubber tends to expand some as it exits the die and the fibers would orient along this expansion somewhat conically from the main rubber flow axis. At higher fiber loadings, excessive head pressure would inhibit successful extrusion. Longer fibers could also pose a problem during extrusion with the likelihood of snagging at the edges of the die. Calendaring and milling of fiber filled rubber will orient the fibers in the machine grain direction; however, the thicker the sheet the less the orientation. Orientation in the vertical plane in thicker sheets can be less than ideal. Optimal directional fiber orientation occurs in sheets from 1 – 3 mm thick. In many instances the user may not want the fibers oriented in the same direction as the calendared sheet. In such cases sections of the calendared sheet can be cut and turned 90 degrees to orient the fiber grain and then re-spliced together with other cut sections back into a continuous sheet. If other angles of fiber orientation are desired, the originally calendared sheet may be cut at the desired (or complimentary) angle on a bias cutter and then re-spliced back into a continuous sheet now having the desired grain angle suitable for ply up into the rubber part to be molded and/or vulcanized. For hand ply up of fiber filled rubber components, punch dies can be used to cut out sections from a calendared sheet noting the direction of the grain. Such sections can then be oriented manually (relative to one another) during ply up as desired for the part being built prior to molding and/or vulcanization. 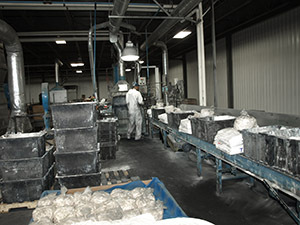 It is common in the molding of rubber to overfill molds so as to not have any voids or thin spots in the molded product. Molds are vented so that this overfill can flow out of the vents. As the rubber being molded flows in the mold and toward the lower pressure areas of the mold vents, the fibers in the rubber will tend to orient with this flow. This may or may not be conducive to the desired performance of the finished part. Mold overfill should be minimized if fiber orientation is a desired attribute in the finished molded part. This would apply to compression and transfer molding. With injection molding lower fiber content and shorter fibers will work best. Compound viscosity and flowability testing can provide insight as to whether a fiber filled compound can be successfully injection molded. In all molding of fiber filled rubber compounds the concentration of fiber at any given location in the molded part can vary some. The highly flowable rubber or plastic phase will flow during the forming process while the fiber is more likely to resist flow. For this reason the vented scrap rubber will likely contain a lower concentration of fiber than that calculated for the fiber filled rubber itself. Generally speaking, the addition of short fibers to rubber improves the “machinability” of the rubber. Vulcanized rubber is often machined by abrading surfaces such as grinding stones, wheels, sandpaper, etc. or by rotating knives to form the final part geometry. Such forming processes can produce considerable frictional heat and some fibers based on polymeric materials can experience localized melting which can clog up abrasive processing components. In such cases, some manner of cooling (pre-freezing the part being machined, cooling during machining with carbon dioxide or water, etc.) can be helpful. The Formulation Program of Finite Fiber’s Technical Services provides assistance in the modification of existing formulations to accommodate the addition of cut fibers. We have found that in a generic black SBR formulation that 10 phr of N330(HAF) carbon black can be replaced by 2 – 3 phr of short fibers (2 – 8 mm cotton, polyester, or nylon) to yield a resultant rubber compound of comparable cured hardness. While not all rubber filler materials (clay, silica, whiting, carbon black, etc.) behave equally in all polymers, we have concluded that for conservative loadings of short fibers this replacement relationship is adequate. The process begins when your company provides Finite Fiber with a starting point formulation. A formulation review is performed and the formula is modified to accommodate the loading of short fibers to improve the desired physical properties while maintaining other physical property requirements of the original formulation. If a blend of fillers is used, there will be a partial replacement of both fillers, but both fillers will still be in the same ratio to one another. If there are silica coupling agent(s) used with certain silica fillers, the loading of these coupling agents will be changed (lowered) to reflect the new loading of the reactive silica filler. In some cases the relationship of the plasticizer to the total filler surface area will be considered and modified proportionally as the total filler loading of the compound is decreased for the addition of short fibers. As formulations are reviewed, other ingredients or levels of ingredients that are questionable in regards to obsolescence, effectiveness, cost, processability, etc. will be noted and recommendations will be made. The intent is for Finite Fiber to work with companies to help them fairly evaluate the reinforcement advantages of using cut fibers in their rubber or plastic formulations. Fibers are functional fillers that replace carbon black and provide superior properties through fiber bonding to the rubber matrix. Our technical services team can assist rubber chemists with polymer testing and rubber testing of compounds modified for fiber loading. We can take the application parameters and define the required lab tests. If the customer does not have the necessary lab capabilities or have lab time available Finite Fiber will work with outside labs to obtain quotes, oversee the testing and interpret the results. Once formulations have been validated by lab results we can work with the customer or a custom mixer to have production samples produced for evaluation. Finite Fiber will make sure the custom mixer has the proper capabilities for producing the desired formulation in the form needed for the customer’s production. Finally, Finite Fiber can assist the customer with processing procedures. You are assured of timeliness and accuracy from conception to formulation to production with each step fully tested and proven along the way. 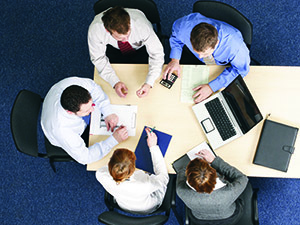 Ask us for more details on this exciting new approach to customer/supplier relations.